I am so proud of these little gems! The day before Christmas Eve my mom and I were going over the Christmas Eve menu and what other folks were bringing. We wanted to make sure the food "went together" as best as it could for a potluck. As we read down the list we realized something: Everyone was bringing something Mexican/Spanish/Latin! We'll our stuffed mushrooms and eggplant lasagna were gonna be great but we needed something to compliment the enchilada casserole, chicken molé, and chili spiced chocolate truffles. (Heaven, that stuff was yummy!) In comes bean salsa in tortilla cups. It all starts with the baked tortilla cups. Heat the tortillas up in the microwave first or they will just crumble. I went with corn because it pairs so well with pinto beans, but you can use flour if you desire. I cooked these bad boys up at the beginning of the day and they weren't stale by dinner time. If you wanna make them a day ahead, just remove them from the muffin pan and place in a airtight container to get their crunch! 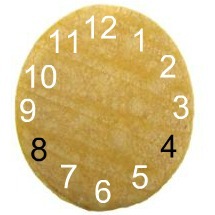 Imagine the tortilla is a clock. A hot clock cause it's right out of the microwave! Please be careful. 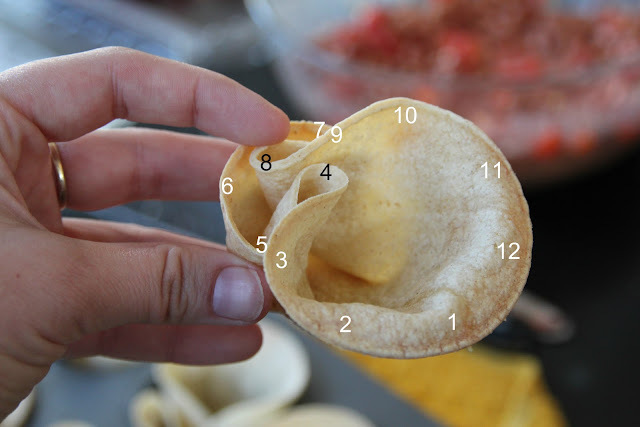 Pinch the tortilla at 3 & 5 in your right hand and at 9 & 7 in your left bringing 8 & 4 together. Place in the cup and repeat. Now on to the filling. Pinto beans, tomatoes, lime juice, jalapeno, onion, cilantro, olive oil, and s&p. That's it. If you wanna leave out the tomato, go for it. If you wanna add bell peppers, try it! I love recipes like this. You can really experiment around. Now, I'd recommend letting the mixture set up for about an hour or 2. This allows the flavors to really meld well. OH YEAH! I almost forgot. Then you get to add avocado right on top. You could leave it out... but why would you want to?? And there you go! These were crazy simple and delicious. And healthy too! If you are vegan or vegetarian, these would be a perfect side dish. I doubled the recipe for the party but you could half it and it would make a great dinner! Inspired by What's Cooking Mexico? 1. Preheat oven to 350f. Fold tortilla into muffin cups. Bake for 20 mins until crispy. 2. Mix beans, onion, jalapenos, cilantro, juice of one lime, tomatoes and a drizzle of olive oil in a bowl. Add salt and pepper to taste. 3. When you are ready to serve, scoop about 2 tbsps of the beans into the tortilla cups. Add a slice or two of the avocado on top and enjoy! 4. Serve them in the pan. They are a little top heavy ;0). The tortilla cups are really cute! Great idea! Also, anything with avocado is a winner to me. I think I may have lost you on the clock-folding, but I'm definitely going to try these :) Thanks! This looks so cute, I love it!